We inform our dear clients that Lucky Technology has announced the discontinuation of the iGuard LM520 series, as well as all related products and accessories. New version of iGuard out now: new technology, same card! iGuard is a simple and innovative time attendance device for the access control and presence detection. It works through the recognition of the fingerprint (access control biometric) or reading the proximity cards (access control RFID). iGuard represents the perfect solution for all the companies, of any size, which need to implement an access control system or want to automate the presence detection and increase the security. RFID cards with other technologies such as 125Khz, Read only, the iCode, HID, ecc. Another advantage is its capacity to manage hybrid card technologies, so there is the possibility to assign to the worker 2 cards with different serial numbers, each one for different tasks. The iGuard with the Universal Connector option is the perfect solution for the companies which want to change their current control access system or automated attendance tracking system without changing the cards already used by the workers. Thanks to this update, the iGuard users will be able to access faster to the embedded web server. 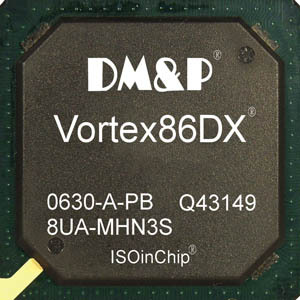 The Vortex 86DX processor works at 600Mhz reducing the time needed for each task. Moreover, it has also been implemented a new operating system, WinCE 5.0, successor of the WindowsCE 4.2, which offers higher reliability in the database management. With pleasure we inform you that we published the new version of iguardsystem.eu web site. To make informations more clear we decided to completly change the graphic layout and to enrich the content. All suggestions and remarks are welcome.